Divesting from pro-Israel corporations that violate Palestinian rights could harm Tandon students job prospects. The “Resolution on the Human Rights of Palestinians,” which would have NYU divest from companies associated with the mistreatment of Palestinians, was presented to the Student Senators Council on Thursday. The resolution will be voted on by way of secret ballot, a security precaution critics of the resolution worry will impede accountability on the part of the senators. Senators at-Large Rose Asaf and Bayan Abubakr, and Alternate Senator at-Large Leen Dweik presented the resolution that highlighted General Electric, Caterpillar Inc. and Lockheed Martin as corporations NYU should cut ties with. “As a Palestinian student, I believe the university has a responsibility to me and to other Palestinians, to stop investing in companies that directly contribute to human rights abuses of Palestinians,” Dweik said. General Electric supplies engines to Israel’s navy and air force, as well as a gas firing engine to NYU Langone. Caterpillar Inc. provides the Israeli military bulldozers — one of which was used to kill American activist Rachel Corrie — as well as diesel engine generators for NYU’s Central Power Plant. Lockheed Martin sells fighter jets to the Israeli military, used in an invasion of Lebanon in 2006 that killed civilians — they are also listed as partners of Tandon School of Engineering and the NYU Center for Urban Space and Progress. Six students for and against will speak about the resolution in another meeting on Dec. 6, which will also be open to all NYU students, after which the council will put it to a vote by secret ballot. According to Asaf, Abubakr and Dweik, this is intended to keep senators safe. All three of the students said they had been threatened in the past for publicly supporting Palestinian rights. Students for Justice in Palestine is targeted by a Facebook group called SJP Uncovered, which posts inflammatory comments about members of the club, saying things like NYU student government “perpetuates hate against Jews by entertaining an anti-Semitic BDS resolution.” Additionally, the site Canary Mission has a profile of her saying she has “spread hatred of Israel” and lists her social media handles. Dweik said she had been similarly targeted, and that is why the vote would be by secret ballot. Some students fear a secret ballot will make it impossible to hold student senators accountable for their votes. President of NYU Realize Israel Adela Cojab mentioned that, with senators representing students who may have different opinions on the issue, it is important to know how they vote. Additionally, Cojab said a lack of public accountability on the resolution and meetings has caused her to lose trust in the body. She mentioned the fact that, although the 23 school senators are elected, 14 senators-at-large are appointed by school senators from the previous year. This self-selection of the body, combined with aforementioned issues, are reasons she feels that the student body needs ways to be held accountable. “We always talk that the Board of Trustees at NYU makes decisions behind closed doors and there’s no transparency and there’s no accountability … and that is very much what I feel with this body,” Cojab said. Among those on student government, only Asaf has the Jewish community listed among their constituencies. This has left pro-Israel Jewish students, who are often at odds with Asaf, feeling that they are not represented. Several of these students attended the meeting concerning the resolution which they see as having a significant impact on them. Another community the resolution may affect is Tandon students. Three of the corporations this resolution demands NYU cut ties with have good relationships with NYU Tandon. Not investing in them could hurt the job prospects of Tandon students who often find themselves employed by these companies according to School Senator for Tandon Joel Urena. “Our relationship with these corporations are made worse by these steps,” Urena said. Later, he clarified that Asaf had reached out to him about working with Tandon students when enacting this resolution if it were to pass, which he appreciated. Although he is not an engineering student himself, he recognizes that his constituency certainly includes them. “I am a bit dismayed that it’s exclusively engineering companies,” Urena said. Asaf said the university’s relationships with corporations that harm Palestinians, engineering-focused or not, is hypocritical to the school’s values. “We will not stand for our institution, in the guise of being a progressive, liberal university, actively funding war and human rights violations,” Asaf said. I am a Senior at Tandon and before today, I didn’t even know that Senators exist to “represent” me as a constituent. I have never been reached out to about ANY issue regarding NYU. Tandon is kept as a bubble and our opinions go completely unrecognized and unheard. If these senators exist to represent the student body, how exactly are they doing that if not reaching out to the groups that they claim to represent? I feel that our voices are going unheard. We are not represented. These senators, who are supposed to be keeping an impartial mind, are using the student government as a platform to push their own biases. Senators are supposed to represent the general student body, yet they are only representing the bodies that they themselves agree with. Everyone elses opinions go ignored. 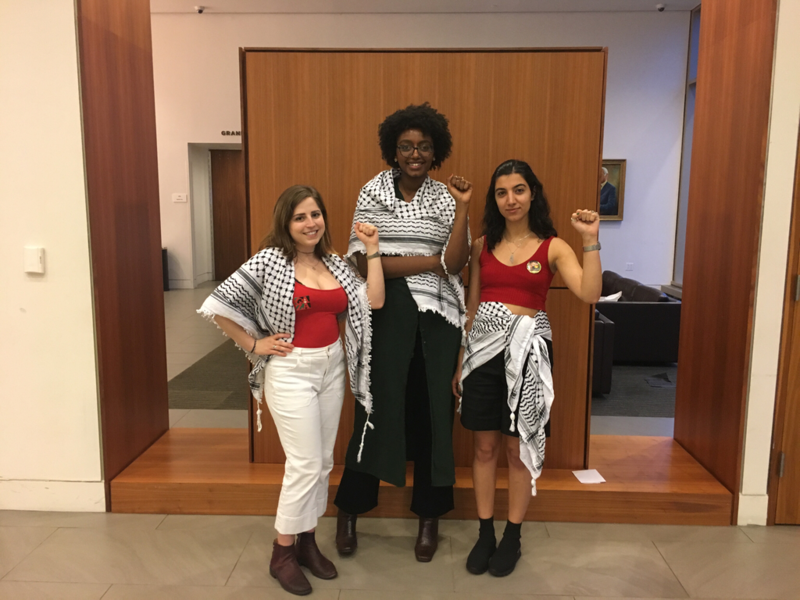 Rose Asaf is a member of JVP, an anti israel organization, and yet she claims to represent the jewish voices on campus. It seems that the JVP and SJP are the only voices that she’s representing. It really is outrageous how anti-Semitic your university and paper are. No fake news? Bet you won’t publish this and bet it won’t even make it to your comments. There are TWO SIDES to the Middle East problem. As a Jew, with Ben Gurion airport stamped in my passport I can’t even enter any of the 22 Arab nations. Why not an article on that? I am both a student alumnus and a retired faculty member who experienced virulent anti-Semitism while teaching there, and had more than a handful of Jewish students, both secular and religious, talk to me about how poorly they were treated by some of the faculty and some other students. These complaints have been made time and again but no one does anything about it. Israel invaded Lebanon in 2006? Wasn’t that after the terror group Hezbollah sent a raiding party over the international border, kidnapped and killed several Israeli soldiers while launching missiles at various Israeli towns and villages as a diversionary tactic? Rachel Corrie was standing in front of a home slated to be demolished because it was covering a Hamas attack tunnel; she died as a pawn of the antisemitic, terrorist group which over the years has murdered hundreds of Israeli civilians with suicide bombers, and launched thousands of rockets into Israeli towns and cities. This BDS resolution stands in support of anti-Jewish murder attacks and in support of radical Islamist terrorism. Shame!